Read and sign the True Woman Manifesto. Leslie Basham: Kim Wagner says when we embrace God’s call to be true women, it will influence men to be true men. Kim Wagner: We’ll have leadership, and we’ll have men that are being fathers to their children, making tough decisions to make courageous leadership choices that before they might have been afraid of what their wife would say or do if they made that choice. Leslie: This is Revive Our Hearts with Nancy DeMoss Wolgemuth, author of Voices of the True Woman Movement, for Thursday, March 22, 2018. At Revive Our Hearts, listeners have written to us about serious problems in their relationships. Some have husbands who won’t handle money. Others are dealing with men who won’t work. Others are struggling with men in sexual addictions. When the men around you won’t lead, are you tempted to take over? That’s one of the questions we’ll explore today continuing in the series "The True Woman Manifesto—Foundations." 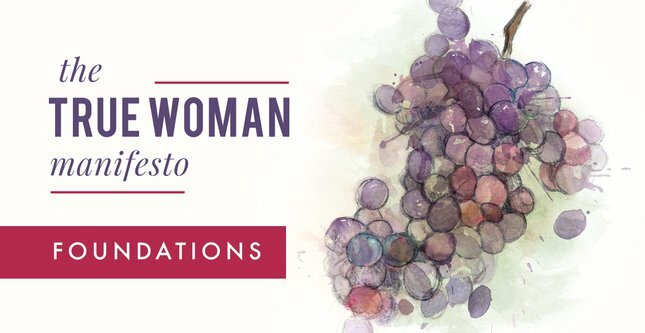 Yesterday Nancy began talking with pastor’s wives Holly Elliff and Kim Wagner about the True Woman Manifesto—how it came about and the influence it’s having. Let’s get back to that conversation. Kim: For the Christian female community at large, whether they were there or not, whether they yet realize it or not, that was a significant historical event. I remember waking up that morning, and I had had time to look through, read through, be a part of praying through the preparation of the Manifesto. So it was wasn’t new to me in that sense. I sent that as a text to you and Holly and Carolyn McCulley and a few of my friends that we had been a part of praying for this and planning for this for a few years. There was such a sense of expectancy that God was going to begin turning women’s hearts back to Him, back to the truth of His Word, to educate women that they might have a sense of, “I’m a Christian. I believe the Word,” but not really a clear understanding of what it looks like to be a true woman, a true woman of God. The declaration and signing of this Manifesto was going to be a tool that would help women to be able to see, “This is what it looks like, and I affirm this is what I believe, and this is what I desire to live out.” And that it would not be just a personal declaration, but that this Manifesto and this movement would begin to affect women’s families, their workplaces, their social environments, their churches, and the nation and hopefully the world. I was so filled with excitement. I was so thankful that you asked me to read the very first portion, the frontal piece of the Manifesto because it really states that the purpose of this is that the glory and the redeeming love of God would be displayed throughout the whole earth. I am so thankful that I believe He’s doing that. He is doing that. Nancy DeMoss Wolgemuth: What we’ve been saying in this series thus far is that women who have been transformed by the power of the gospel can themselves become transformers. Dream with me for a few minutes here and just let’s kind of imagine what kind of impact an army of true women could have in their communities, in their homes, in their culture, in the darkness, in the paganism, in the wrong-headed thinking. What difference could this band, this remnant of true women make? What might that look like? Nancy: It’s really the woman that sets the temperature. And so I think part of what has happened is that we have lost our distinctiveness as believers. And I think as Nancy said, just dream here for a minute about what that would look like. I would love for that difference to be so evident that you could not mistake a Christian for somebody else, that we would look so different, that we would respond in such different ways that there would be no question about what we believed or where we went or what was valuable to us or what we spent our money on. Kim: When that kind of transformation takes place and begins to affect a whole nation and culture, people will know that our God is God. That’s why I get so pumped about this, because I want people to know that God is God. He is who He says He is. He is powerful. He is able to transform. His Word is truth. And the culture will know that. Nancy: And right now it’s the atheists who are winning. They’re the ones whose books are selling. They’re the ones who are getting the hearing. The blurring of distinction between believers and non is not because non-believers are starting to act more like believers. It’s because believers are starting to act more like non-believers. Kim: Like our God has no power. He’s not able to transform. And yet He is. But believers are not submitting themselves to that power. Holly: And I think part of that is education. Part of that is recognizing the enemy. I do believe that we have yielded ground for so many years and what we are seeing now is Christians, because there is so much darkness now, that Christians who choose to walk after Christ, to be controlled, and to claim the name of Christ, and to live according to His Word now have more opportunity than ever to look different than the culture. So if we are making those choices, we cannot live in the darkness that is going to become more and more present. I don’t think that means we walk around depressed. But I think it means we have to recognize ourselves as an army, as those called of God to live. Scripture says we are like aliens cast abroad. God has planted us where we are so that we can become light and salt, and we will look like light and salt. I think that’s what’s encouraging about this to me. I think women are recognizing the fact that they cannot do status quo in our present culture. To just live as a nominal, nice person is not sufficient because the stakes are higher now than they’ve ever been. Nancy: I think we’ve got to be honest enough to say that many of us as Christian women have not even lived like nice Christian women. There are so many standards that the world has adopted that Christians have adopted as well. I’m thinking for example about the coarseness of women today—in the media, in the public, the mouthiness, just saying whatever you think without self-control over the tongue. I mean, how many of us struggle with control issues over our own tongues? And how many Christian women can you hear just gossiping, venting? How often do I do it? So in a sense not only are we not being light, but we’re being like the darkness. You think about what happens when the economy tanks. Well, non-Christians don’t know the Lord. They can’t trust Him, so they worry. Nancy: Or take their life or take somebody else’s, or take matters into their own hands in ways that may not be consistent with God’s priorities for their lives. But as she and her husband prayed and sought the Lord—they’ve got young children in the home, and they felt that this was not the season based on the priorities God has given them as a family for her to be away from those children during the day. It’s not that she was unwilling to go out and get a job. That was her instinct. But they decided, “This is a time for us to stay the course and to make some tough choices.” I’m not saying everyone should make this same decision, but they made the choice for her to stay in the home. Then she’s telling me this story of how God provided a job for her husband. And I’m thinking, This is counter-cultural. Not that God owes her husband a job, not that it’s always going to be a fairy-tale ending. Sometimes we may have to be willing to be without in some areas of our lives or to suffer hardship. But the willingness to embrace the hard path, to do the hard thing, that’s counter-cultural. Kim you talk about long marriages and people staying faithful in their marriages. Well, I don’t know if they’re so impressed when a marriage stays together when it looks like you’re married to the perfect husband though we all know there isn’t one. You think yours is. Holly, you think yours is. So people look at you guys. Kim: I don’t know if I’d use the word perfect. Kim: Because, oh my, the pressure of being married to a perfect man; I can’t imagine. Holly: I’m grateful. He’s a wonderful man. Nancy: But somebody might look at your husbands, you Holly or you Kim, and say, “If that were my husband, of course, I could stay faithful to him." But what impresses them is when your husband makes a decision that is not a wise one that has repercussions for your family, and you don’t berate him about it. You go to the Lord, and you ask the Lord to intervene. You handle things with a spirit of humility and gentleness rather than verbal brow beating. That’s counter-cultural living. Holly: A woman who is governed by God’s Spirit. I’m thinking about a gal in our church who had surgery this week. I went to visit her. She was still under anesthetic, could not open her eyes or move any part of her body. But as we were talking with her husband, she was quoting Scripture. She could kind of pick up on our conversation. Every once in a while her husband would say something, and she would say, “Oh, but God is so good. Here’s what He did." She couldn’t open her eyes. Her voice was odd. But what was in her was coming out. She has spent so many years in very tough circumstances pursuing the Lord. And now it’s in the fabric of who she is. Even at a moment when she was not fully conscious, that’s what was coming out of her. I think to me that is what thrills my heart. We have the opportunity as women to be so governed by God’s Spirit that no matter what circumstance we are in, God Himself can pour out of us onto everybody we meet—those we touch, those we encounter. What they meet will not be us but will be Christ. When that happens, then God will be set free in this nation, in the world, to do what He desires to do everywhere we go. Kim: One of the common complaints I hear from women across the nation, and I’m sure you do too Holly with counseling, is that men don’t lead. Men don’t lead, and men are wimps, or men are passive. I think when women really get a hold of what God wants to do through this True Women movement—and you’re talking about what would it look like in the big picture. I think we’ll start to see a nation of true men rise up to make courageous leadership choices that before they might have been afraid of what their wife would say or do if they made that choice. Holly: And if for no other reason, perhaps, because women instead of speaking what they are thinking will be hitting their knees and lifting those men to the Lord so that God can do that work in their husbands. It’s not the woman trying to transform her husband. It is the woman giving God the opportunity to do that for her. That is a huge need, and it’s a heart wrenching need when you read those emails. But if it drives us to God so that we have a nation of women here who are going to God for what they need and asking Him to be who He is, to be powerful, to accomplish what they can’t accomplish, then we do see God-sized things happen. It’s not about just a woman deciding to look a certain way or sound a certain way. It’s about a woman accessing what God has stored up in eternity so that it becomes reality on earth. Nancy: Holly, that really takes us back to where we have to start and continue all the way, and that is to our personal relationship with the Lord. This is not a lifestyle that we are called to live apart from Him. It’s not a lifestyle we can live apart from Him. I would hate to think that women would listen to these programs or take this Manifesto and read it and memorize it and study it and say, “I’m going to be a true woman if it kills me.” It may, you know. Holly: It would kill us apart from Christ. Nancy: Because we apart from Christ have no power to live this life. This is Christ’s life that has to be lived in us. And the starting place is in our relationship with Him. We’ve talked about reflecting to the world the beauty and the wonder of who Christ is. Well, what is a refection? We know about how the moon has no light of its own. We look at it in the sky at night, and it’s beautiful, and we say, “It’s a beautiful full moon.” But the moon has no light. What is the moon doing? It’s reflecting the light of the sun. Being a true woman of God that reflects the beauty of Christ and His ways requires that we live in the presence of God, that we reflect His beauty. That means we have to be looking at Him. We have to be focused on Him. If I am looking at, focused on, obsessed with the world’s programs and styles and thinking and philosophies and movements, that’s what I’m going to reflect. Kim: If I’m focused on the problems in my marriage, if I’m focused on the economic situation, if I’m focused on the circumstances around me . . . that’s why it is so important—Hebrews 12—“Fix our eyes on Jesus.” That is the answer. Nancy: And I think about that verse in 2 Corinthians 3. We all, with unveiled faces, beholding as in a mirror the glory of the Lord. We are transformed [transfigured the word is], into the same likeness from glory to glory by the Spirit of the Lord (v. 18, paraphrased). Becoming a child of God so that then we do have the ability to access everything He’s already prepared for us and the ability to live this life not because we put it on like a coat but because from the inside out we reflect Christ. Nancy: Perhaps what Holly just shared reflects your heart, and you’ve been listening to this series. Maybe you’ve been listening to Revive Our Hearts for a long time, or maybe you’re a new listener. But you have realized that you do not have that kind of relationship with Christ. So even today repent of your sin. Believe the gospel. Place your faith in Jesus Christ. Let Him come into your life, take over your life and begin the process of making you a true woman of God. If that’s what God has been saying to you today and you’re responding to Him in your heart wherever you are right now—in your van, in your workplace, in your home, listening on your iPod, reading this transcript on the Internet, listening on the radio—then let me encourage you if you have said, “Yes Lord,” to contact us. Let us know that God has been drawing your heart, that He has brought you conviction and has brought you to faith in Christ. We’d like to rejoice with you but would also like to send you some resources that will encourage you with your walk with the Lord. And then just a word to what may be true of many of our listeners who do have a relationship with Christ but are trying apart from the Spirit of God to live a life that you cannot live. Let me just encourage you to cry out to the Lord and say, “Lord, I can’t do this. I cannot be the wife, the mom, the single woman, the woman in the workplace, the friend, the sister, the daughter. I can’t be the woman You made me to be. I need You to be giving that control in my life, to be giving me Your power and Your grace to live out Your life in and through me." Ask the Lord to give you a fresh hunger for Christ so that you can behold Him and beholding Him be transformed into His likeness and then be able to reflect that likeness to others. Holly: Trying to do that apart from Christ is exhausting. But when you see the Holy Spirit energizing you to obey and do the right thing, it makes your relationship with Christ a reality in your life that will be evident to yourself. It will be evident to your children, to your husband. It goes beyond a head knowledge, as Kim said of what the truth is, to how it affects my life when I go home when I’m in relationship with my husband, because I have pledged my life to live out these truths, which are not Nancy DeMoss truths. They’re not true woman truths. They are biblical truths. You cannot be invaded by the Holy Spirit taking control without others around you also seeing the reality of that in your life. Leslie: Nancy DeMoss Wolgemuth has been talking with Holly Elliff and Kim Wagner. Each of us need the kind of transformation they’ve been talking about. The True Woman Manifesto can be a valuable tool in that process. This document offers you a depth of biblical truth that will stand up to any challenge. At the same time, it’s practical, giving you a picture of what it means to be a true woman in our day. Read the True Woman Manifesto at ReviveOurHearts.com. Consider adding your name to the document, and as we heard today, start passing on this valuable information to other women who need it. We’re able to provide this kind of material online and through podcasts and the radio thanks to listeners who support the ministry of Revive Our Hearts. Nancy’s here to explain how you can especially help right now. Nancy: Well, throughout this month I’ve been sharing with you that we are asking God to raise up more Revive Our Hearts Monthly Partners. These are listeners who see God at work at in the ministry and they want to partner with us in spreading this message. These partners pray for the ministry; they share it with others, and they give financially $30 or more each month. I want to say a big "thank you!" to everyone this month who has responded as we've been asking God for 400 new partners. And, welcome to our new Monthly Partners, as well as a huge "thank you" to those who are already partners with this ministry. Now, if you've just signed up to be a new Monthly Partner, that means you've probably alread received your welcome gift. That's two copies of my newly-released, updated, expanded book, Lies Women Believe and the Truth That Sets Them Free, and two study guides that go with the book, two bookmarks, and the "lies" teaching on CD. I’m excited to see how the Lord is going to use these resources in the lives of our new partners as well as the friends they share these materials with. If you are one of your new Monthly Partner, just a reminder that you can also ask for a free registration to True Woman '18, coming in September this year. And we'll be sending you a monthly devotional that you can use each day. So if you've signed up to become a Monthly Partner that's what you can expect. And if you haven't signed up yet, but you want to, these are benefits you can enjoy as well. You can get more information, more details to sign up to become a Revive Our Hearts Monthly Partner at ReviveOurHearts.com, or give us a call at 1–800–569–5959. Thank you for sharing in this ministry with us. This is our ministry together—serving the Lord, serving women around the world as we call them to experience freedom, fullness, and fruitfulness in Christ. Leslie: Thanks Nancy. How is this kind of message resonating with women in other parts of the world? Tomorrow we’ll get an update. Please be back for Revive Our Hearts. Revive Our Hearts with Nancy DeMoss Wolgemuth wants to show you the beauty of a life surrendered to the Lord. The program is an outreach of Life Action Ministries. *Offers available only during the broadcast of the radio series. Get an update for each of Nancy's daily teaching programs.